No need to make a full-size scarecrow when all you want is to greet fall visitors with a smile! 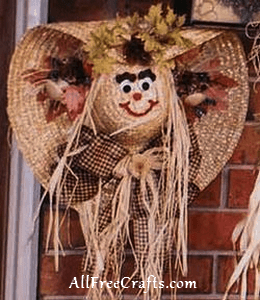 Make this happy straw hat scarecrow wreath for your front door using simple craft supplies. Begin by using hot glue to secure a little raffia (for hair) around the area where the hat is folded at the top (refer to photo) fold the top of the hat down to the edge of the center round. Secure with hot glue and a small piece of wire. Leave a little extra wire on the inside of the hat for hanging. Glue or wire one fall pick to the top centre and two sides of the hat. Glue wiggly eyes in place and using different size pompoms form a mouth, nose and eyebrows, using hot glue to secure to hat. Tie a double bow (I used paper wired ribbon) and secure with wire. Tie another bow with raffia and glue in place on top of ribbon bow. You can add a small flower or leaf on top of the raffia bow in the centre. Copyright © 1999-2015 Susanna Spatone All rights reserved.